Spring is here! The trees and flowers are budding and the days are getting longer. People have come out of their winter hibernation and they are headed outdoors to lead more active lifestyles. Studies show that exercise can boost your mood and lower your stress, not to mention help you tone up and get rid of a few unwanted pounds. Outdoor exercising also gives you a chance to connect to your surroundings and community in an exciting way- just don’t forget to think about your safety as you head into the great outdoors. Many urban city dwellers face a number of issues when they want to exercise outdoors; chief among them is a lack of safe green spaces. However, you can still enjoy the great outdoors even if you live in the concrete jungle you can help your fellow community members get fit along the way. 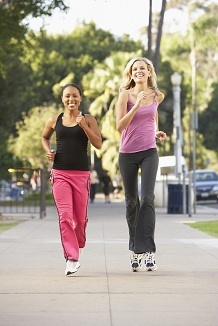 Walk, jog or exercise with a partner. It is safer than being alone, its fun, and serves as added motivation. Locate an outdoor exercise club in your community or start your own. Chances are other people are interested in exercise too- they just don’t know where to get started, locate some like minded folks and get moving. The buddy system is best but if you have to exercise solo make sure a relative or loved one knows what time you are leaving, your route, and make sure you call them once you are back home. Don’t start out on a lonely road just wondering about. Have a plan of where you are going and know how to get there. There are lots of cool Android and iPhone apps that create exercise routes based of your personal goals (time, distance, weight loss, etc.). Make sure your route is well lit and not deserted. If you are walking at dawn or dusk wear reflective clothing; make sure you are visible to people and cars. Leave the flashy jewelry at home. You may want to ditch the headphones, you need to be free of distraction and in tune with your environment. Headphones make it difficult to hear cars and people behind you. Invest in a personal safety alarm or a high-pitched whistle. Have a form of identification. Make sure your cell phone is charged and turned on. Have a minimal amount of money and keep it in a secure place.